CMF’s Commander attended an international anti-piracy conference held in Dubai, United Arab Emirates (UAE), April 18 and 19. 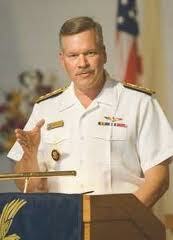 Vice Adm. Mark Fox, commander, U.S. Naval Forces Central Command, Combined Maritiem Foces, and a U.S. delegation led by Ambassador to the UAE, Richard Olson participated in the two-day conference which gave government and shipping industry leaders from around the globe a chance to convene and seek out solutions to ending piracy in the region. Held under the theme ‘Global Challenge, Regional Responses: Forging A Common Approach to Maritime Piracy,’ the meeting focused on finding ways to counter the recent spike in criminal activity at sea, off the Somali coast and in the Arabian Sea. Many nations have deployed their naval assets off the coast of Somalia in an effort to counter piracy, especially in the strategic shipping lanes in the Gulf of Aden. Navies, including those of the UAE, coalition forces and regional nations, have met Somali pirates with force; however, piracy continues to be a growing international problem. The conference allowed military and government officials to present the developing issues of international law, addressing the root causes of piracy and opportunities for intelligence sharing. Mohammed Abdullahi Omar, the foreign minister of Somalia, expressed his concern with the issue by stating that despite the best efforts of foreign nations to contain pirate activity, pirates have gotten smarter and are repositioning their operations further away from Somalia’s coast, making them harder to catch without an effective Somali government. Somalia’s government is prepared to act through a comprehensive strategy on piracy, Omar said, but it needs international help. States in the area were urged to extend any logistical support they could to the military response effort, which has notably reduced the achievement rate of pirate attacks and therefore ‘must be continuously and vigorously pursued’. This was the first time the UAE has held an international conference on the topic, taking a strong stand on the problem and proving that they are ready to step up and assist in the fight against piracy. There were record high numbers in piracy attacks worldwide for the first quarter of 2011, reaching 142, according to the International Maritime Bureau. Almost 70 percent of the attacks occurred off the coast of Somalia, up from 35 percent in the same timeframe just last year.